Rock your Muscle with this hot-looking seven (7) piece Flame Graphic kit! 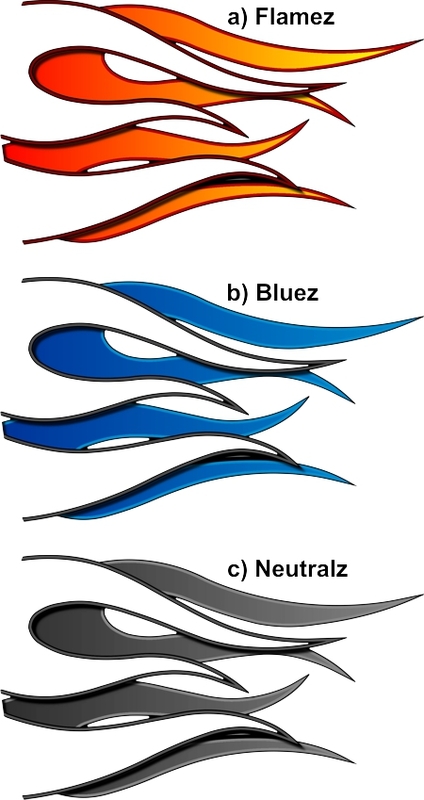 Available in one (1) of three color combinations (Flamez, Bluez or Neutralz), Flame design elements feature our gentle faded flames in selected colors. Digitally printed with DuraCOLOR graphic technology, kit is manufactured with premium automotive grade vinyl film materials. Vinyl product is manufactured with a grey-pigmented solvent-based repositionable adhesive and cast construction for highly conformable performance of the most difficult curves and irregular surfaces. As a further step, graphic is covered with a 2 mil clear laminate (Gloss or Matte) which provides protection from miles of abuse. The kit is precut, requires NO TRIMMING and includes easy-to-follow general online instructions.